As a mysterious fire rages through the hills above a privileged town in Southern California, Archer tracks a missing child who may be the pawn in a marital struggle or the victim of a bizarre kidnapping. What he uncovers amid the ashes is murder--and a trail of motives as combustible as gasoline. The Underground Man is a detective novel of merciless suspense and tragic depth, with an unfaltering insight into the moral ambiguities at the heart of California's version of the American dream. 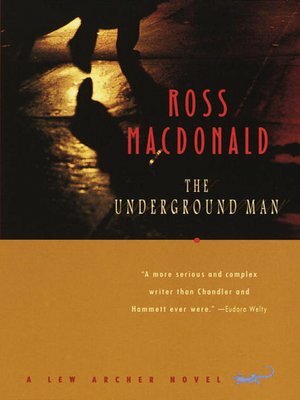 If any writer can be said to have inherited the mantle of Dashiell Hammet and Raymond Chandler, it was Ross Macdonald. Between the late 1940s and his death in 1983, he gave the American crime novel a psychological depth and moral complexity that his predecessors had only hinted at. And in the character of Lew Archer, Macdonald redefined the private eye as a roving conscience who walks the treacherous frontier between criminal guilt and human sin.